UK: Seabed landlord Crown Estate will assess whether the total capacity of eight offshore wind farms built off England and Wales could be increased by 3GW, it has announced. Successful applications could be converted to option agreements in summer 2019 when Crown Estate makes formal offers to further develop the sites. It is unclear which sites could be extended and by how much. In November 2017, Crown Estate announced it would consider making new seabed rights available to offshore wind developers, and invited applications to extend existing sites. Closure of the extension opportunity paves the way for a single, comprehensive route for awarding new rights for future offshore wind development off the English, Welsh and Northern Irish coasts, rather than having two processes running concurrently, the government body claimed. 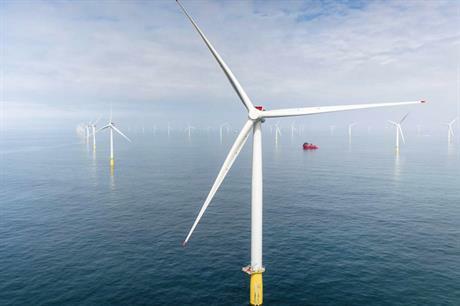 Head of energy development Will Apps said: "Extension projects have the potential to make an important contribution to the UK’s offshore wind pipeline, in line with the sector’s growing ambitions and in advance of potential new leasing. "Over the coming months we will work closely with the successful applicants and our stakeholders to ensure careful consideration of environmental impacts and existing seabed users interests, ahead of any award of rights." The UK has the highest installed capacity of offshore wind farms in the world, with just over 7.1GW currently in operation. It has a further 2.6GW under construction and could build out 3.6GW by 2024. Renewable UK executive director Emma Pinchbeck, said: "Today’s announcement shows that there is huge appetite to invest in new offshore wind in the UK, which could create thousands of jobs and provide cheap power for consumers. "This new capacity could help deliver the industry’s vision for offshore wind as the backbone of a clean, reliable and affordable energy system."